One person was killed and 31 were wounded when terrorists hurled three grenades on Vaishnodevi shrine-bound buses at the general bus stand here this morning. The deceased was later identified as Madan Lal, conductor of a bus (JK02F 3479). Among the injured were two Amarnath pilgrims from Ahmedabad and Bihar. 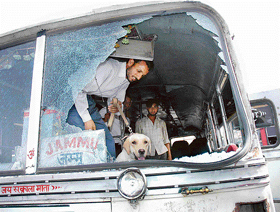 A securityman with a sniffer dog searches a damaged bus after serial grenade blasts at the Jammu bus stand on Monday. Do you support the move to give voting rights to NRIs? At least eight migrant labourers were killed and five injured when unidentified militants opened fire upon them in the Kulgam area of Anantnag district this afternoon. Even as certain members of the Nuclear Suppliers Group have evinced keenness in supplying fuel for nuclear reactors, India and the USA began talks here today on the operational modalities of the agreement on the peaceful uses of nuclear energy based on the drafts exchanged between the two last month. The controversy over the marriage of Surinder Kumar, a lower caste boy of Kharkari village, to Poonam, an upper caste girl of Dhanana village in Sonepat district, took a curious turn today with reports surfacing here that the girl had been married off on Saturday. The Supreme Court, which had said that any agitation in violation of its order would amount to contempt of court, today sought details from the Centre about continuation of demonstrations by pro-reservationists even three days after a prohibitory order was passed by it on May 31. The UPA government appears to be determined to re-introduce the Office-of-Profit Bill, returned by President A.P.J. Abdul Kalam, in the “same form without any alterations” in Parliament during the coming Monsoon session. 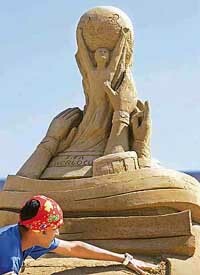 The Supreme Court today dismissed two PIL petitions for ban on Hollywood movie ''The Da Vinci Code'', which has already been prohibited by five states on the ground that it hurt the sentiments of Christians and can create a law and order problem.